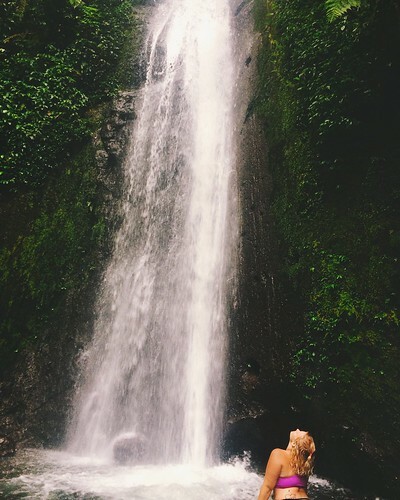 The jungle in Costa Rica is filled with treasures, and most hikes through the Costa Rican rainforest are bound to lead to at least one waterfall. They’re everywhere! In fact, all of the tours I’ve done with Blue Osa have involved a waterfall. And you don’t just chase these waterfalls – you play with them! Swim in their lagoons, bathe under them, stand behind them, even climb them and rappel down. There’s nothing like hiking around a beautiful jungle, enclosed by miles and miles of vibrant green, moss-lined primary rainforest, only to have it open up all of the sudden onto a massive, powerful waterfall. Standing in front of these majestic forces of nature is astounding in its own right, but it’s even more rewarding when you get to interact with them. It’s hard to choose, but these are my three favorite Blue Osa eco-tours. 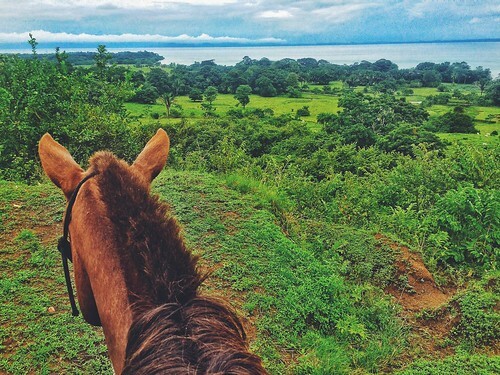 Horseback riding in Costa Rica is not your grandmother’s horseback riding. I know a few guests expected it to be a boring trot around a field like you’d pay for at a county fair. We trotted a bit, sure, but it was along a beautiful beach. Then we galloped through open fields and across rivers with the farm dogs in tow as scarlet macaws flew above and monkeys played in the tall trees nearby until we reached a mountain covered in primary rainforest. Our horses navigated the tangled jungle marvelously, trekking through foot-deep mud and up steep inclines so that we didn’t have to. All around us lay the magic of deep primary rainforest – butterflies of all colors flying by, coati crossing through the bushes, dew shining on the overgrown ivy and moss of the impossibly tall tree trunks. After about 30 minutes uphill, we reached a peak. The forest cleared out, and we sat atop our tall horses with a breathtaking panoramic ocean view of the entire gulf, all the way out to Panama. 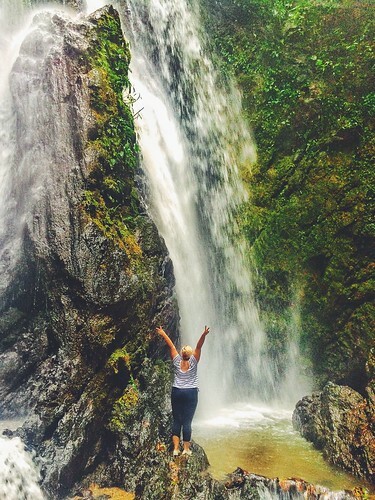 As if that wasn’t enough, we proceeded to trek down into a little pocket of the rainforest where the most brilliant of Matapalo’s waterfalls lies. I got off my horse, hiked down into the falls, and waded through the stream until I was close enough to feel its spray on my face. After that, I abandoned any desire to remain dry and stuck my head right under the refreshing waterfall. It was worth it! The Matapalo area, just south of Blue Osa, is filled with wildlife, beautiful beaches, primary rainforest, and waterfalls. Fio, one of Blue Osa’s guides (I swear, he knows more about Costa Rican wildlife than an Atlas), led the hike into the area’s primary rainforest. 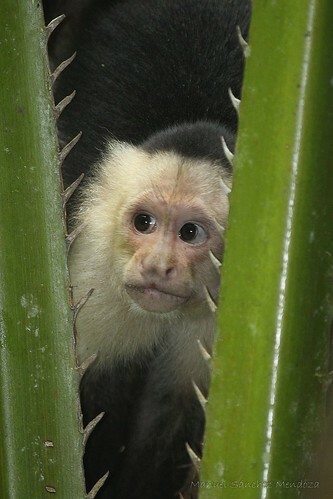 I’ve been in Costa Rica for a while, and I’ve never seen so much wildlife in such a short period of time! Just on our way to the hike we saw falcons, coati crossing the street, howler monkeys, spider monkeys, a sloth, hummingbirds, blue morpho butterflies, and a beautiful roseate spoonbill bird (not to be confused with a flamingo). While hiking through the rainforest, we saw many other birds, butterflies, and currasow. We trekked to the first waterfall where there was a bridge suspended about 5 feet above a small blue lagoon. We got into our suits and jumped off the bridge, cooling ourselves down in the refreshing river water. Then we went to the second, much larger waterfall, with an even bigger lagoon. I swam through the cold water to the waterfall and went underneath and behind it for a great view. Then I climbed up the rocks next to the waterfall a few feet and dove into the lagoon. It was one of my favorite days at Blue Osa! 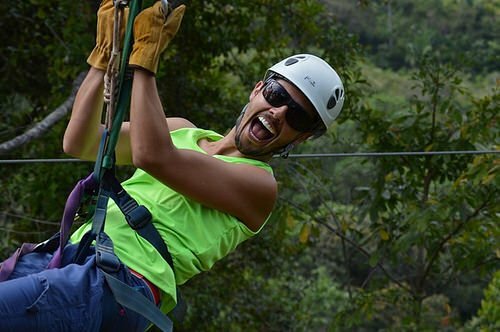 Strolling through forests and lounging under waterfalls is a blessing, but for those who really want to get their adrenaline pumping or conquer their fears, waterfall rappelling is the way to go. You can even combine it with the tree-climbing tour, where you rope up and climb 70 feet up a massive Strangler Fig tree. The waterfall rappel tour takes you to the big Cape Matapalo waterfall in the middle of a lush rainforest. You get instructions on how to best rappel, harness up, and then start 100 feet up from the ground and work your way down the face of the waterfall to the pool below. It’s a truly thrilling way to experience a waterfall! Like I said, it’s really hard to choose a favorite. 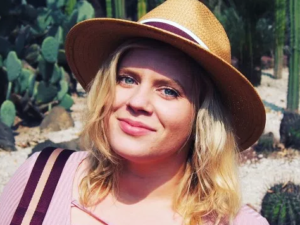 These are my favorite waterfall-chasing tours, but I’ve also really loved ziplining, whale-watching, and learning how to surf! The opportunities for adventure at Blue Osa are endless, as are those for relaxation.